Department of Materials Science and Engineering Professor Lourdes Salamanca-Riba has been appointed a University of Maryland (UMD) ADVANCE Professor for the 2017/2018 academic year. Supported through a National Science Foundation grant, the UMD ADVANCE Program is focused on improving work environments, retention, and advancement of tenured and tenure-track faculty, especially under-represented groups, in ways that improve the culture for all faculty members. To help accomplish this, ADVANCE appoints faculty representatives from across campus and colleges to help build a network of faculty who can serve as networkers and conveners for ADVANCE initiatives. ADVANCE Professors support strategic networks across disciplines, facilitate opportunities for learning and leadership, enhance agency through knowledge and planning for career advancement and by recognizing faculty contributions and accomplishments. They serve as role models and catalysts within their colleges. 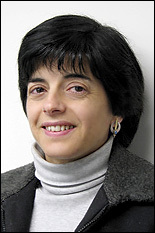 Dr. Salamanca-Riba is a Professor in the Department of Materials Science and Engineering whose research focuses on nanotechnology. She earned her Ph.D. in Physics from MIT prior to joining the University of Maryland in 1987, becoming a Professor in 2000. Previous ADVANCE Professors in the Clark School of Engineering have included Drs. Elisabeth Smela (Mechanical Engineering), Allison Flatau (Aerospace Engineering), and Carol Espy-Wilson (Electrical and Computer Engineering/ISR).